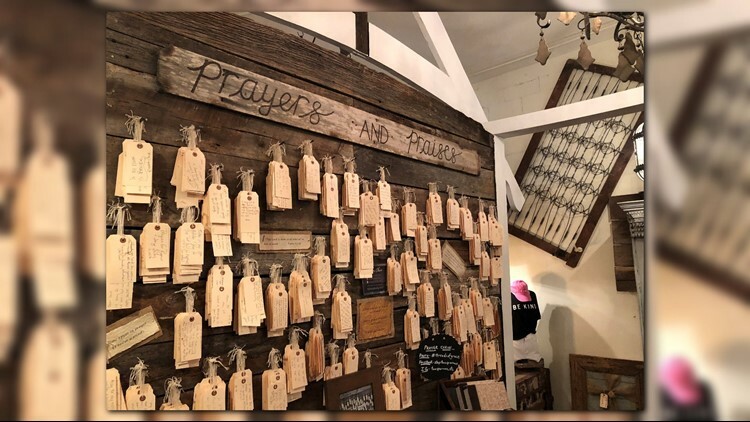 Two Sparrows is a boutique in the heart of St. Augustine where customers can offer up a prayer on the shop's "Prayer and Praises Wall." One local store’s walls are full of clothing, but in between the racks is a wall for prayer. Two Sparrows is a boutique in the heart of St. Augustine, and it's always keeping up with the latest fashion trends. For the past three years, it’s been a place for customers to have a shopping experience like no other. The boutique’s "Prayer and Praises Wall" has attracted more than 3,000 customers, within the past six months. It’s become a place for visitors to offer up a prayer while they’re out and about. Customers are given a small luggage tag to write their wishes on if they choose to do so. “They take a prayer card, and there are several. They put their prayer on here… then they can place it here on the wall,” Mead said. Prayer is part of Two Sparrows’ culture. Visitors come into the store, take requests from the wall and pray for those wishes of other customers they’ve never met. Each time a customer enters the store, the staff is certain that they’re making an impact. “Even if they come in the store and get a feel of the Lord in the place, and don’t buy a thing, we’ve done what we wanted to do, here in St. Augustine,” Becker said.